The Brexit vote is only a few weeks old but Britain is already coming apart at the seams. The political establishment is imploding, but what is more interesting is the new culture war. Poll data show Leave voters to be disproportionately low income, less educated and from the provinces rather than the cities. The rebuffed London elite can barely conceal their scorn. The falling pound and stock prices make the right-leaning economists and business experts (whom Michael Gove rudely dismissed as irrelevant) feel vindicated. Reported incidents of racism reinforce the feeling among left-leaning sections of the elite that multicultural Britain is under siege from within by nativist forces. It is suddenly respectable to say that the British working class (and its American Trump-enamoured counterpart) is xenophobic, stupid and full of blind resentment. It will be a serious mistake to view the Brexit revolt exclusively through the prism of economic efficiency or multiculturalism, ignoring the distributive conflicts that built up to it. The working class in many developed nations has been hammered by globalisation over the last few decades. Populist right-wing movements are on the rise in Europe and elsewhere because they alone articulate a clear acknowledgment of the problem and offer one kind of solution – trade and immigration restrictions. The political left is struggling because it adopts inconsistent postures and clings to an agenda of the past. Its prominent voices are drawn from an educated elite who have been the beneficiaries of globalisation, not its victims. There is reason to believe, however, that the economic forces that started asphyxiating the working class forty years ago will eventually catch up with the white-collar professionals. It is essential for the left to discover a new paradigm for income and wealth redistribution that goes much beyond the welfare state. 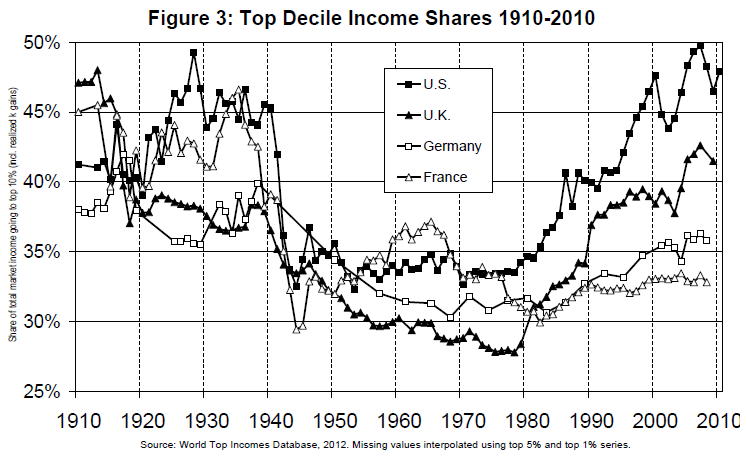 There has been a remarkable rise in economic inequality in the Western world in the last thirty years, especially in the Anglosphere (UK and US in particular). This has completely unravelled the reduction in inequality that was achieved in the decades after the second world war and has restored it to levels last observed in the pre-Depression era, when capitalism was untamed. In the US, the share of GDP earned by the top 1% of households fell from 24% in the late 1920s to 9% in 1970, but has shot up since to 20% in 2011. What is behind this great unravelling? It is important to distinguish between the main villain and the supporting cast. Progressive taxation and the protections of the welfare state have been cut back by right-wing governments going back to Ronald Reagan and Margaret Thatcher, but that does not explain the rise in pre-tax inequality. The decline of the labour unions may have also played a role, but it should be seen more as a symptom of the labour force’s weakening bargaining power in the face of economic fundamentals rather than a cause. Globalisation is the prime suspect. 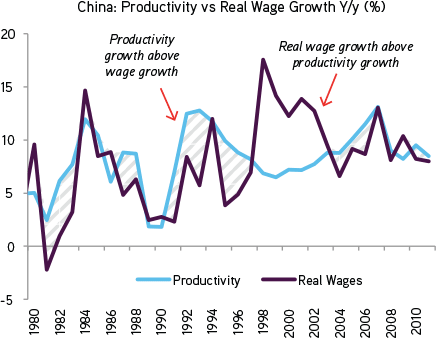 Wages in the industrial world rose significantly after the war in response to labour scarcity and rising labour productivity. From the late 70s and early 80s, however, the protected pool of well-paid Western workers was exposed to competition from cheap Third World labour (and later automation), thanks to lower shipping costs, modern communication technology and freer trade. This, more than anything else, pulled out the rug from under the feet of the working class. However, globalisation is not a simple tale involving the worldwide march of capital to exploit labour. That broad, brush-strokes Marx inspired portrait hides important complexities. First, some of the cost savings reaped by capital has been passed on to consumers through competition. Apple, with its near monopoly in the high end segment, earns more than 90% of global profits from smartphone sales inspite of less than 20% market share. Fierce competition has lowered prices and nearly squeezed out profits for everyone else. The flight of the electronics industry to Asia has benefitted not just shareholders but also those consumers whose purchasing power has not been eroded by globalisation. Many of them voted for Remain. Second, globalisation is not simply a conflict between capital and labour; it creates a tension between worker interests in rich and poor countries. The biggest fault lines actually run down the middle of labour itself. The eastward migration of world manufacturing has driven up wages and living standards in East Asia even as it hollowed out the US’s rust belt or England’s industrial towns. This is most succinctly illustrated by the elephant curve, which shows the income growth at different percentiles of the world’s income distribution in the last three decades. There is a massive bulge in the stretch where the middle class of the emerging economies sit and a deep depression around the percentile region occupied by the working class of rich countries. There is also a sharp spike at the very high end of the elephant curve, which represents the good fortunes of capitalists and white-collar workers in the developed world. This brings me to the third reason why globalisation does not easily forge a broad solidarity of labour. So far, the rise in inequality in the advanced economies has been substantially driven by an increase in wage inequality. Wages of unskilled and semi-skilled workers in the USA virtually stagnated thirty years ago, but skilled wages show a healthy growth. Globalisation restructured the advanced economies from manufacturing towards services, which are not easily offshored and hence more shielded from international competition. But the new jobs demand specialised knowledge and sound cognitive skills, making it difficult for a lot of people to take advantage of the opportunities. Globalisation, broadly conceived, is the free movement of goods, capital and labour across national borders. These movements have very similar effects on income distribution. Whether the factory moves to China or Chinese workers move in to operate the factory, the competitive pressures on domestic labour are the same. Once this equivalence is acknowledged, some political positions would seem quite paradoxical. Why is it that the left loves immigration but is suspicious of free trade and offshoring? There are three good reasons. First, immigration adds a cultural layer to the economic repercussions. Immigrants bring in not only their cheap labour but also their language, customs, cuisine and values, which threatens or enriches the native culture depending on your perspective. The global elite consumes not only the physical goods, but also a cosmopolitan culture and lifestyle. They need their sushi restaurants, Afro-pop beats and ethnically mixed neighbourhoods as much as they need their iPhones. Second, the fingerprint of the corporate sector is too visible on the offshoring of manufacturing jobs but not so much on immigration. Bangladeshi cab drivers, Mexican fruit-pickers, Jamaican nannies and East European waiters compete directly with locals for low-end service jobs or self employment. Protests at the G7 summit and support for other leftist causes may be driven more by animosity towards political and corporate power brokers than sympathy for the domestic working class. The third and most important reason has to do with the immigration policies followed by developed nations. Immigration is actually tightly controlled, both in volume and composition, letting in primarily low skilled workers together with high skilled workers in selective sectors where there is a serious skill deficit (in the UK, 29% of immigrant workers are employed in the lowest paid occupations, as opposed to 21% of the native population). This controlled immigration caters to the elite’s cultural and political sensibilities and protects its self-interest as well. It is interesting to ask: what would happen if all restrictions on immigration were removed? A Gallup poll found that an estimated 700 million people worldwide would like to emigrate to another country, with the most preferred destinations being a handful of rich nations. If the entire world became borderless, Gallup estimates that the UK population will rise from 61 million to 107 million. If only the UK did away with immigration control, this figure would be much larger, because many immigrants whose first choice destination is some other rich country will be deflected into the UK. Even setting aside the enormous strain on public services, this will pose the same livelihood threat for elite, educated workers that the rest of the working class has faced so far. The great influx is likely to happen across the skill spectrum – the enormous earnings gap between rich and poor nations exists for doctors and engineers as much as plumbers and taxi drivers. The internationalist elite does not want nativists to shut the door, but it must also ask itself an honest question – why not keep it wide open? Why just leave a crack to let in a handpicked few? The truth is, the incomes of the highly educated and professional class have been propped up because their jobs cannot easily be done from overseas and tight caps on immigration have preserved their scarcity in the labour markets of rich countries. Modern technology is, however, beginning to make this position tenuous. The rise of innovations like medical tourism, legal process outsourcing and MOOCS (massively open online courses) will increasingly make the location of a service provider irrelevant. When the floodgates open, creating a truly global labour market, even workers sitting at the top of the occupational ladder will find the party is over. The typical social democratic suggestion that wider access to higher education will reduce inequality in rich countries is a false hope. It is doubtful if even white collar workers in the West can fend off competition from the poorer world forever. Moreover, if skills and degrees became more widespread, it is likely to pull down the top of the occupational pyramid more than it raises the bottom. The only reason skilled labour has not been knocked off its perch yet is the artificial embankments that surround it – immigration policy, 20th century technology and barriers to higher education. How long will they hold up? If we look past the growing skill gap in wages, the real problem should stare us in the face. Inequality of incomes within the wage earning class pales in comparison to the inequality in capital ownership. In the USA, 42% of financial wealth(stocks, bonds, bank deposits, etc.) belongs to the top 1% of the population and the bottom 80% own less than 5% of it. This staggering inequality of wealth has grown in the last 30 years, but it was already very high even before the new gilded age unfolded. Its impact was previously softened by the scarcity of labour, which allowed it a big share of the pie. While the share of GDP that was paid out to workers as a group (both skilled and unskilled) was roughly constant for several decades at around two-thirds, it has declined from 66% in 1980 to 57% today in the US. In the era of globalisation and automation, this is a logical outcome and is likely to continue further, perhaps much further. It is this shift which deserves the closest scrutiny, not the differential fortunes of skilled and unskilled labour. When a boat sinks from one end, the other end is often propped up high above water, leading to a scramble to reach there and a false sense of security among those who already have. The idea that education is the key to escaping the ravages of globalisation in rich societies is similarly illusory. The real key is financial wealth, whose returns are steadily going up. The enraged cosmopolitans who are denouncing the revolt of the underclass derive their comfortable lives from human capital, not financial portfolios. They are in the same sinking boat. One of the striking features of politics in the rich countries is the way mainstream political parties have lost the plot. They are increasingly upstaged by popular movements (the Tea Party, Occupy Wall Street), upstart rivals (UKIP, France’s National Front) and mavericks arising from within their ranks (Donald Trump, Bernie Sanders, Jeremy Corbyn). The rush to referendums may be a sign of the nervousness the political establishment feels. There are two broad paths that may be taken to arrest the inequality-generating tendencies of globalisation. One is to shut it down and the other is to find radically new mechanisms of income redistribution to spread out its advantages. The populists on the right have lurched for the former. They have attacked immigration and trade deals, and infused economic isolationism with the emotional power of nativism. It is condescending to think that rabble rousers like Trump or Farage have generated a groundswell of support only by peddling chauvinisms. Blue collar voters also see in their rhetoric one kind of promise of a revival of fortunes. The left’s instinct is to find redistributive solutions to the problems of globalisation, but it has come up terribly short. One reason is that the leadership and prominent voices on the left often hail from an educated professional class whose labour market fortunes have been so divergent from that of the working class that its understanding of the latter’s problems is not always spot on. Another reason is that the left’s own past success at reining in capitalism has created an intellectual baggage that it finds difficult to shed. There are three main weapons in its traditional arsenal that empower the state over markets – financial regulation to curb rents at the top, Keynesian policies to stabilise macroeconomic fluctuations and social safety nets to create economic security. It is too obsessed with rescuing this agenda from the jaws of right-wing policies like Europe’s current austerity regime. None of these programmes address the deep structural causes of modern inequality, which have to do with significant shifts in the rates at which labour and capital are paid as a whole. Protections of the welfare state may come closest to addressing the problem, but they come to the aid of workers only in unusual circumstances – illness, unemployment, retirement and disability. There is not much in the structure of New Deal type programmes that will counter the trend the average worker faces. He is not out of work but is stuck with pay cheques that are shrinking. Another way to put it – the traditional programme of the centre-left parties does a good job of redistributing income from the top to the bottom but not to the middle. One study on the US economy finds that the top 20% of income earning households make net contributions (taxes paid minus the value of government benefits received) of $48,189 on average, while the bottom 20% of households get net receipts (benefits minus taxes) of $24,764. In contrast, the middle 20% receive more benefits than they pay in taxes, but only to the tune of $4,130 a year. It is this middle which is increasingly under the strain of globalisation and where the swing voter sits. Ideas like universal basic income, which pays all citizens a healthy allowance regardless of their circumstances, may form the bulwark of a new redistributive politics. This cannot replace the social insurance programmes that provide a more targeted kind of economic security – unemployment assistance, health insurance, pensions. That raises an obvious question – how to fund it? Since the crux of the problem is the rising share of capital, whose ownership is extraordinarily unequal, there seems to be no way around the need to make it more equal. This will require very high rates of taxation on capital income and perhaps even confiscation of a portion of domestic equity. Resource rich governments like Saudi Arabia or Norway finance a lot of their social spending from sovereign wealth funds created by oil revenues and budget surpluses. Western governments can follow the same path, provided they have the political will to build up such funds in the first place. It will require a much more radical turn in left politics.